뉴욕에 갓 입성한 새내기들 부터 뉴욕을 사랑하는 뉴요커들, 뉴욕이 지긋지긋한 사람들까지 모두가 함께 모이는 뉴욕 최초의 토크 콘서트 및 신입생 환영회 / 대학축제 Inception: Hello New York에 여러분을 초대합니다. 신나고 재미있는 행사들로 이름을 알린 MOI’M이 오랜기간 동안 준비한 Inception은 컬럼비아, 하버드, NYU, 예일, 프린스턴, 듀크, 유펜, 파슨스, SVA, 조지타운, FIT, 프랫, 버룩 등 다양한 학교의 졸업생들이 기획에 참여한 이전까지는 한번도 없었던 색다른 행사입니다. 이번 행사는 만남의 시간, 뉴욕에 관한 토크 콘서트, 그리고 에프터파티로 이루어져 있으며 요즘 가장 핫한 가수 에릭남이 특별 초대손님으로 함께 할 예정입니다. 네트워킹, 재미, 음악과 감동까지 뉴욕의 불타는 토요일을 위한 모든 요소를 갖춘 Inception을 통해 뉴욕에 첫발을 내딛는 새내기 부터 기존의 뉴요커까지 모두가 힐링하는 좋은 기회가 되었으면 합니다. 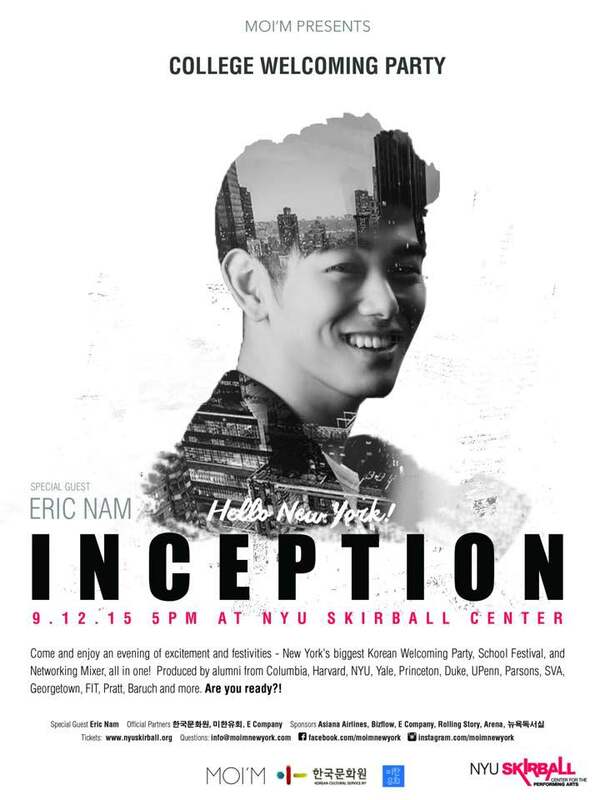 Inviting all New York newbies, New York lovers, and New York haters to the one and only first-time-ever New York’s biggest Korean school festival, welcoming party, and networking mixer, all in one, Inception: Hello New York! Inception will start with a networking mixer, leading to a welcoming party and an orientation on life in New York, and conclude with an after party! The special guest, Eric Nam is one of Korea’s hottest and trendist entertainer, interviewer, and k-pop artist. Produced by alumni from Columbia, Harvard, NYU, Yale, Princeton, Duke, UPenn, Parsons, SVA, Georgetown, FIT, Pratt, Baruch and more – with a proven record of throwing the hottest events in town, MOI’M’s Inception is destined to be the No.1 event of the year! This is the opportunity to meet new people in the city and enjoy a night out with entertainment, music, and much more! Eric Nam is a Korean-American singer-songwriter, entertainer and entrepreneur active in South Korea. Upon graduating from Boston College in 2011, Eric had accepted a position with Deloitte Consulting’s Strategy and Operations team in New York. However, following a series of twists and turns Eric found himself on MBC’s Star Audition, a show similar to American Idol. Following a Top 5 finish in Star Audition, Eric was signed to B2M Entertainment and has since become a household name in Korea. A regular in Korea’s music scene, Eric has promoted 3 singles in Korea, Heaven’s Door, Ooh Ooh, and I’m Okay, and has recently charted at #1 on several charts. Eric is the main host of Arirang TV’s most popular program, After School Club, broadcast in 190 countries, and is also an MC on MBC’s international hit We Got Married. Eric also makes regular appearances on many of Korea’s top rated and most popular TV and radio shows, including Running Man, Saturday Night Live, Hello Counselor, CultTwo Show, and many more. Eric is the “go to” personality for celebrity interviews and press in Korea. He has worked with names such as Robert Downey Jr., Jamie Foxx, Miranda Kerr, Matt Damon, Chloe Moretz, Paris Hilton, Emma Stone, Amanda Seyfried, Mika, and Noel Gallagher, to name a few. Eric’s interviews, both international and Korean, have garnered rave reviews due to Eric’s wit and ability to connect with interviewees on a personal level; they have also become viral hits with millions of views, worldwide. Due to Eric’s various successes, he has recently joined Pikicast, one of Korea’s most powerful and fastest growing startups, as an Editor, and is creating/curating fun, original content. He has also partnered with Production O as the company’s Creative Director. Eric manages the ideation, creation and execution of content and strategic partnerships that seek to develop and improve brand awareness, overall image and influence of international celebrities and brands in Korea and Asia. Eric is fluent in English and Korean, and is highly proficient in Spanish and Mandarin. He is an avid foodie and photographer and hopes to continue bridging the gap between the East and West through exciting cross cultural projects. Only 21+ will gain access to After Party. ** Please note that all sales are final and nonrefundable.